To reach the put-in from Curracautín go west on the paved road towards Victoria and you will cross Puente Dillo in 4-1/2 kilometers (first you will pass over Puente Amantible). After crossing the bridge immediately turn right and drive up a private road until you reach a locked gate. We were given permission from landowner to leave our vehicle and access the river through a grassy trail. Because the banks are steep, slippery and nearly vertical there are few access points to the river. The elevation at this point is 500 meters and on November 19 first descent we had an estimated flow of 600 CFS. We were told the river has year round flow. To reach takeout from Puente Dillo continue west on paved road but after only 100 meters go straight onto the gravel road and follow it 8 km to Rari Ruca bridge on the Cautín at 420 meters elevation. There is a fluvial gauge on the north side of bridge. 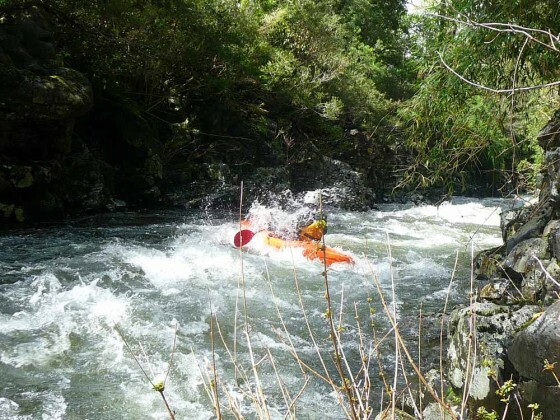 This 8 km stretch of class 3 and 4 whitewater drops 80 meters for average drop of 10 mkm or 50 FPM. After 2 km on the Dillo it joins with Rio Blanco doubling the flow then after another 4 km joins with Cautín. The takeout is 2 km downstream at Puente Rari Ruca. There is a fluvial gauge on the north west side of the bridge and on our mid November first descent it registered 7 (possibly .7 as it was hard to read). A for sure radical class 5 adventure lies upstream. 22 additional km of as yet un-run river remain virgen. A potential put in for this stretch is on the major tributary at Puente Corcoludo which can be reached via the unpaved road to Termas Tolhuaca at an elevation of 1063 meters. Bed rock sluice boxes, heavy vegetation will makes this a time intensive venture. If someone gives it a go please let me know how it worked out.